Eighteen Acre Lane was simply a farm track giving access to many of the fields in Preston Plucknett, that lay north of Preston Lane (today's Preston Road). 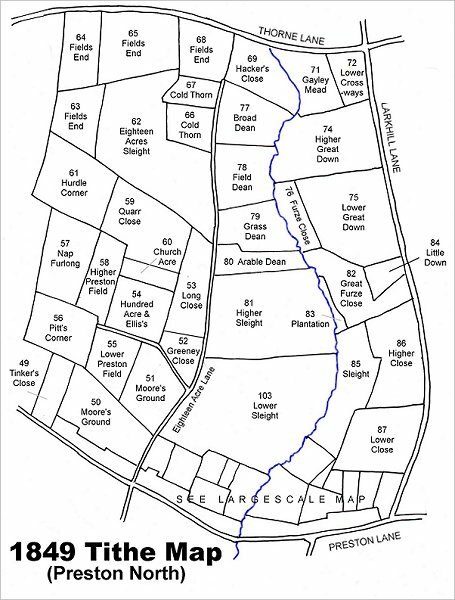 The largest field it approached was Eighteen Acre Sleight (Parcel 62) - hence the name given to the lane. A short spur at its southern end ran off to access fields to the west. The spur was roughly in the area of the play area south of Stourton Way, between Long Close and Long Mead. During the latter part of the nineteenth century the Preston Plucknett Flax Works were built in a field called Higher Sleight (Parcel 81) half-way along Eighteen Acre Lane. This resulted in much of the lane receiving a surface more suited to heavier traffic. 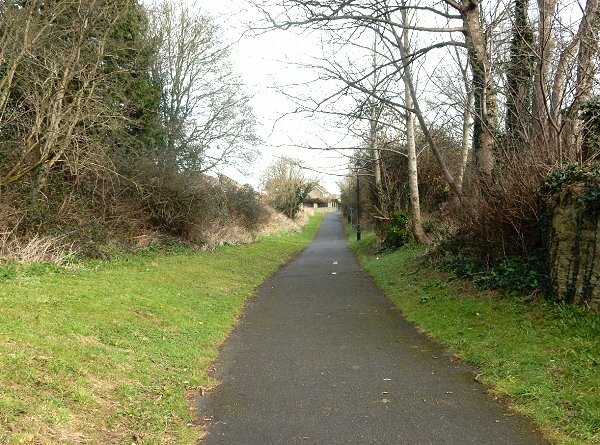 When Abbey Manor was built in the 1980s, Eighteen Acre Lane was surfaced as an amenity access path following the line of the former lane from Preston Road all the way to the Abbey Manor shops. Map based on the 1849 Tithe Map showing the field access track, Eighteen Acre Lane (now a footpath) running up the centre of the map. This is a 1946 aerial photograph showing Eighteen Acre Lane running from top to bottom of the photograph just left of centre. 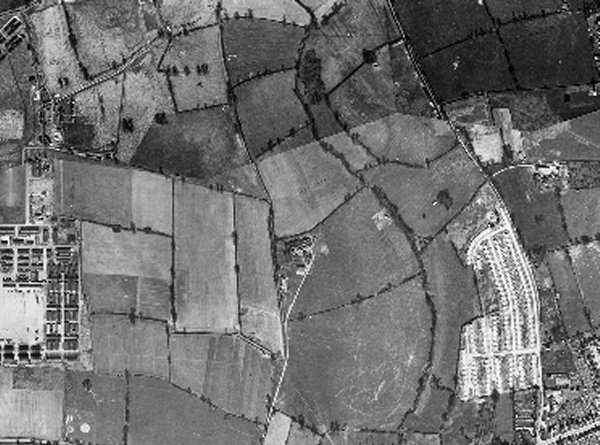 At lower left is Houndstone army camp and at lower right is the post-war Larkhill Lane pre-fabricated housing estate. At centre is the Preston Plucknett Flax Works. 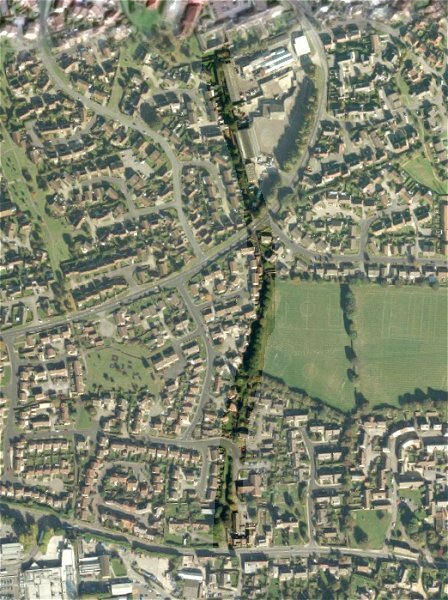 The modern aerial photograph 'borrowed' from Google Earth showing the modern footpath (I've darkened the route to make it stand out) which traces the line of the former Eighteen Acre Lane. Preston Road runs across the bottom and the Abbey Manor shops are at top centre. Today Eighteen Acre Lane is an amenity footpath running from Preston Road, across Abbey Manor Park, as far as the Abbey Manor shopping centre. This is photographed from Preston Road in 2016.